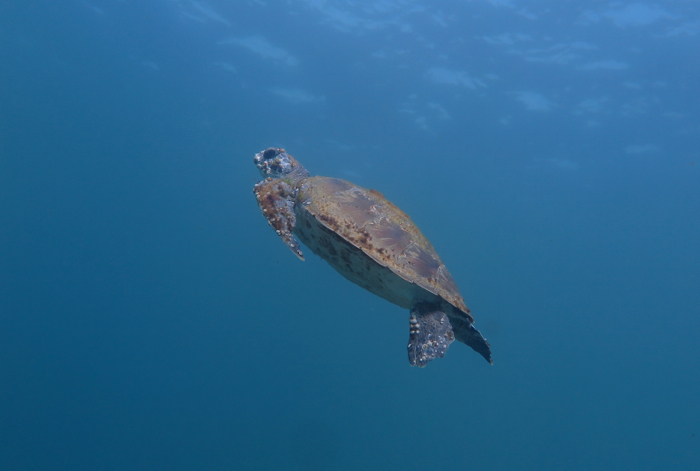 In January on a dive I came across this turtle. Despite my invertebrate interests, whenever I meet a large turtle in the sea I feel I am being given a glimpse of the soul of the world. 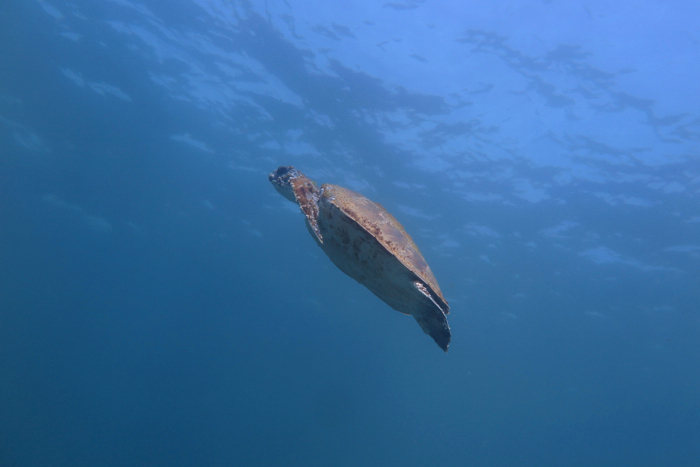 This one was quite beaten-up, swimming with only two and a half flippers, and made a laborious passage up to the surface to breathe. 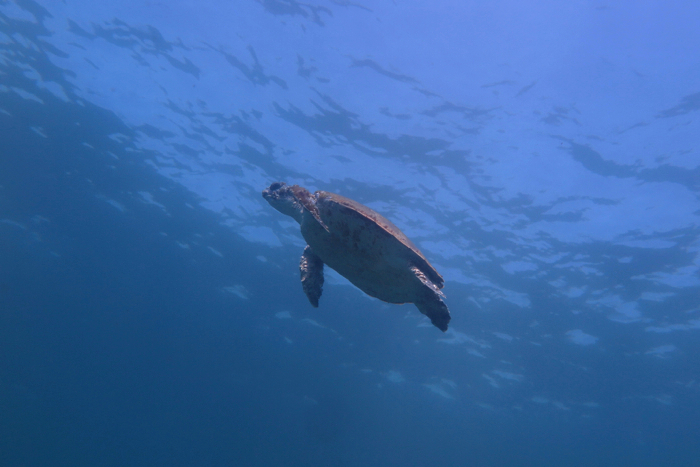 I wanted to follow, but it’s not safe to go up and down like that on scuba, so the turtle became more distant as it climbed. Its marks of age reminded me of an experience I had when I first began watching and learning about cephalopods, about 10 years ago. In my initial encounters with Giant Cuttlefish, they gave me an impression of being quite old. They are so large, so complicated, and sometimes have a scarred and world-weary look. I was then surprised to learn that Giant Cuttlefish have very short lives – just one to two years, even for the largest ones. The same is true of nearly all cephalopods in the “coleoid” group that includes octopuses, cuttlefish, and squid. They are nearly all short-lived, often with lifespans of just a year, or up to four in the case of the Giant Pacific Octopus. These numbers are tiny. There are nondescript fish sitting on rocks that live for centuries. Decline is not inevitable in living systems, as they are continually rebuilding, replacing their material. 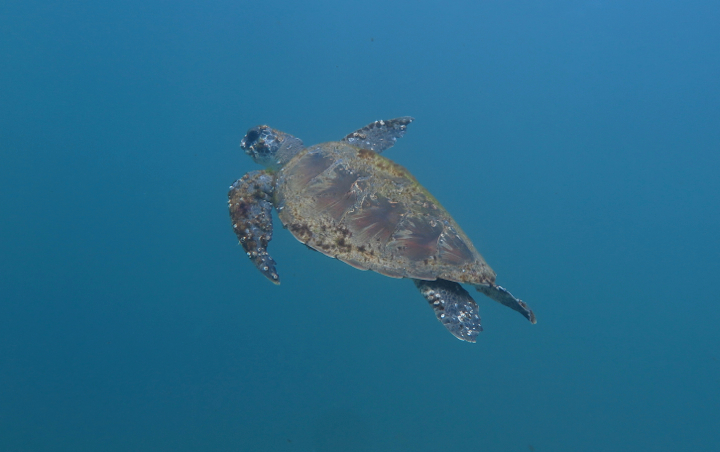 Sea turtles, it is thought, live for 80 years or so. Cephalopods, on the other hand, often reproduce once, or through one season, and then die. All this had me reading about evolutionary explanations for aging – theories of how evolution not only shapes an animal’s body and behavior, but sets its natural lifespan, too. When I say “natural” lifespan, I mean how long an animal will live if it is not killed along the way by a predator or other mishap. There’s now a well developed theory of the evolution of lifespan. The main ideas were worked out in the 1950s and 60s by two of the giant figures of evolutionary theory in those years, George Williams and William Hamilton, after a first sketch had been given by an immunologist, Sir Peter Medawar, in the 1940s. Though the theory has precise and formal versions, the main ideas are simple. They also, as far as I can see, have particularly good application to cephalopods. As I understand the theory, the simplest summary might run as follows. The timing of death by sheer “old age” in a species is set by the likely timing of other sources of death, especially predation. The severity of the risk of death by external causes sets the timetable for the apparently quite distinct phenomenon of internal bodily breakdown. Cephalopods have soft bodies, mobile lives, and many predators. At any given season, their chances of making it to the next season without being eaten will be pretty small. A turtle, on the other hand, faces many threats when it is a juvenile but fewer once it has grown up and has a hard shell. The Medawar and Williams effects should still operate in principle, but on a time horizon far from the one that applies to cephalopods. Hence the old soul on its ponderous climb to the surface at Manly. * Update: Another story has just appeared about long life in a deep-sea cephalopod species, Vampyroteuthis infernalis, the Vampire Squid. What about Giant Squid? Their lifespan is unknown, but is thought to still be under 5 years. This paper about clownfish looks at the evolutionary theory of aging in a marine context. Sharks can bite through turtle shells, apparently. Life for an adult turtle is not completely risk-free. 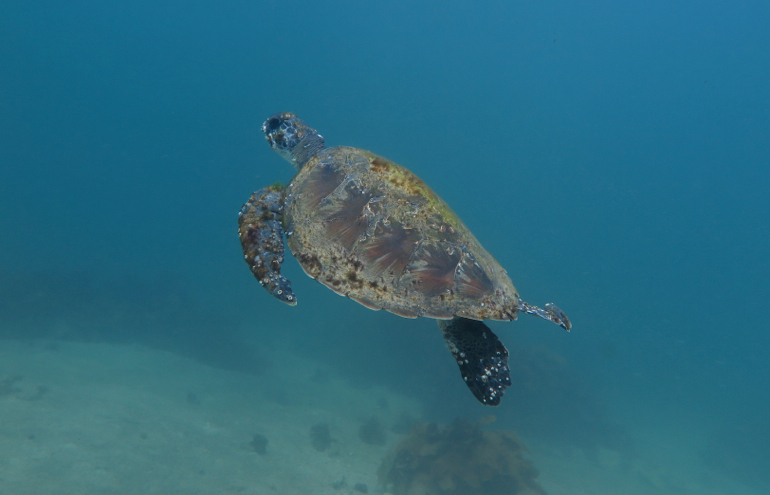 This entry was posted in Cephalopods, Vertebrates and tagged ageing, longevity, turtle. Bookmark the permalink. I hadn’t seen it. Nice. Those turtles treat the cameras better than our octos do. That’s a really nice one. Octo-looter.